I just about overdosed on gasoline vapours. Right now it is -22 degrees C out there, and it is fairly cool in the garage. I removed the right side arm and the large gear cover, and proceeded to clean off the grease and junk off the main gear and it’s pinion. That took a lot of gasoline and a lot of rubbing with a terry-cloth rag. But the gear and the pinion are nice and clean now. Looking over every tooth, aside for a little piece of metal that was embedded in the root between a couple of the large gear teeth, everything looks good. 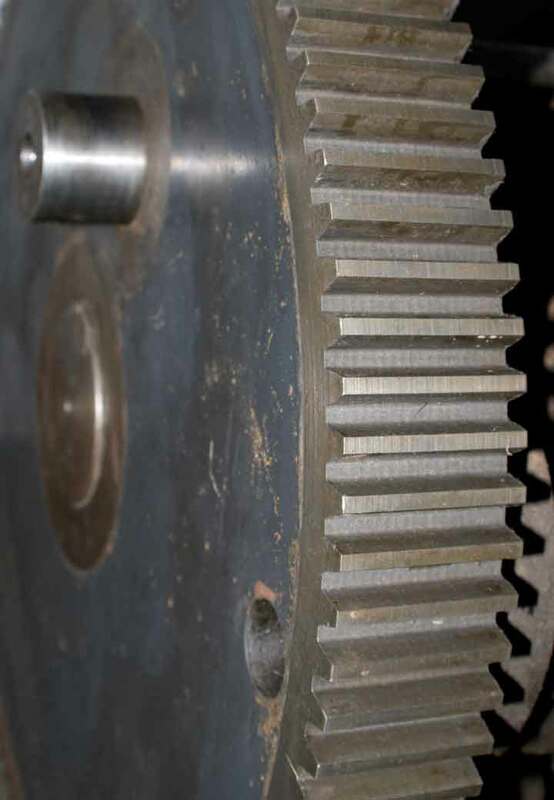 The pinion is not aligned very well with the main gear (it’s offset by about 1/4 inch), and I am wondering if the pinion is deliberately moved towards the press frame to keep the flywheel shaft positioned in place. Also there is hardly any wear on the gears.